This product is slow in its action so give it some time you'll probably start to feel better towards the end of the 25 days or after some time, just remember this product is for long term relief. May work well for depression of Bipolar Disease as well. 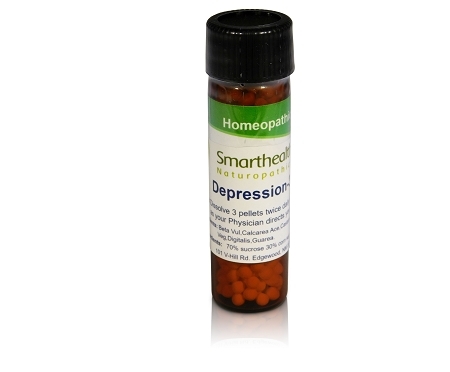 Homeopathic Anti-depressant. This product has no side effects or adverse reactions associated with it . It's made in a FDA supervised laboratory using state of the art manufacturing methods. Made in the U.S.A . Safe for all age's. Directions dissolve 7 pellets under the tongue once daily for 25 days or as your Physician directs you. Active ingredients: Calcarea Ace,Beta vul,Castanea,Carbo Veg,Digitalis,Guarea. These statements have not been evaluated by the FDA. This product is not intended to diagnose,treat,cure or prevent any disease.